Mention the word education and for many it will conjure up the image of the classroom. Depending on your experience of this it may be a happy memory and something you wish to repeat or something you are glad is over and to be avoided at all costs in the future. There is of course huge value in “formal” (more classroom based and accredited) education. However there is also equal value in “informal” (more community based) education and learning. For many adults informal community based education provides a second chance to perhaps put behind them a poor education experience earlier in life. This mixed approach to education recognises the fact that there are many different learning styles and accommodates those who prefer to digest knowledge through listening, reading and writing and those who prefer to learn by doing. Unpicking some of our early experiences of education, and therefore shaping our memory of it, is the thorny issue of recognition, examination and qualification. Many of our formal education experiences end with an examination and a pass or fail judgement and again this will suit some learners but by no means all. It is important that all education and learning is recognised. From externally accredited qualifications, through to a certificate or increasingly a digital badge, or simply (but as importantly) the self-satisfaction of learning a new skill or undertaking a different experience. These different forms of recognition will encourage further interest in learning, perhaps leading to a Lifelong or Lifewide approach to learning as discussed here on Lifewide Education’s website. The notion of co-operation is also important when considering approaches towards teaching and learning. A collaborative and co-operative approach to teaching and learning creates the space where all participants are encouraged to share their own unique mix of knowledge, skills and experiences so that the group can learn together. A good example of this comes from the Hong Kong Institute of Education and can be viewed here. We are committed to supporting the international co-operative movement to meet its Principle 5 commitments whilst also working with adults and others who are not part of the traditional co-operative movement but who might be involved in different types of work organisation and who are committed to a different type of education. 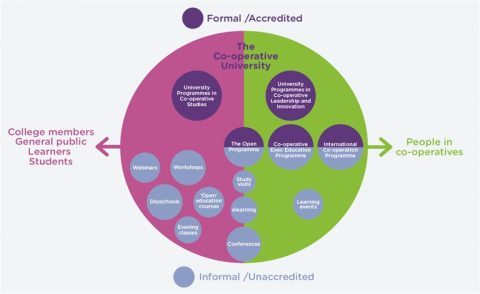 The Co-operative College understands the value which a mixed or blended approach to learning brings and is committed to providing and co-creating a range of co-operative education and learning which suits all and meets their needs. So from our ideas and plans for a Co-operative University, through to our range of online and eLearning courses and modules, our study tours and our twilight and community based programmes we aim to provide a mix of both formal and informal education, which is both accredited and unaccredited, and where all learners are recognised for and enjoy their learning experience.